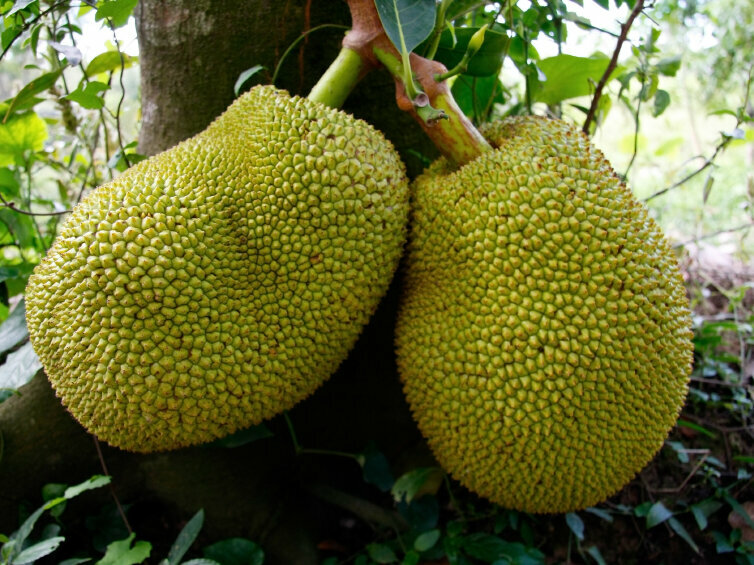 Jack fruit is the largest fruit tree in the world. Native to India, it also grows in other tropical climates such as Bangladesh. According to one study, they’re one of the most nutritious fruits including vitamin b, potassium and protein. Additionally, they’re low in calories. This is one of the reasons they’re promoting it in countries wherefood scarcity is a concern. If you’re curious to try it, it’s often available at Carribean or Asian markets. Just look for the giant spiky, green blob. The taste according to NPR is similar to juicy fruit gum. 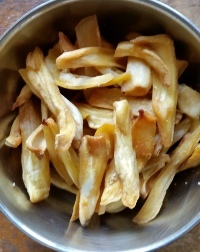 As to be expected dried jack fruit chips from Anand contains few of the nutritional benefits described above though it does contain 20% of daily value for fiber. The twisty shape is fun and they have a slight citrus smell and flavor. In this form it’s nothing like juicy fruit. A better comparison would be plantain chips – it’s starchy and slightly salty in a tasty way. 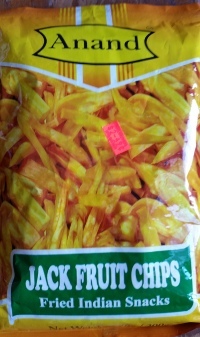 Anand Jack Fruit Chips are satisfying and a nice change from regular potato chips. The snack is vegan.